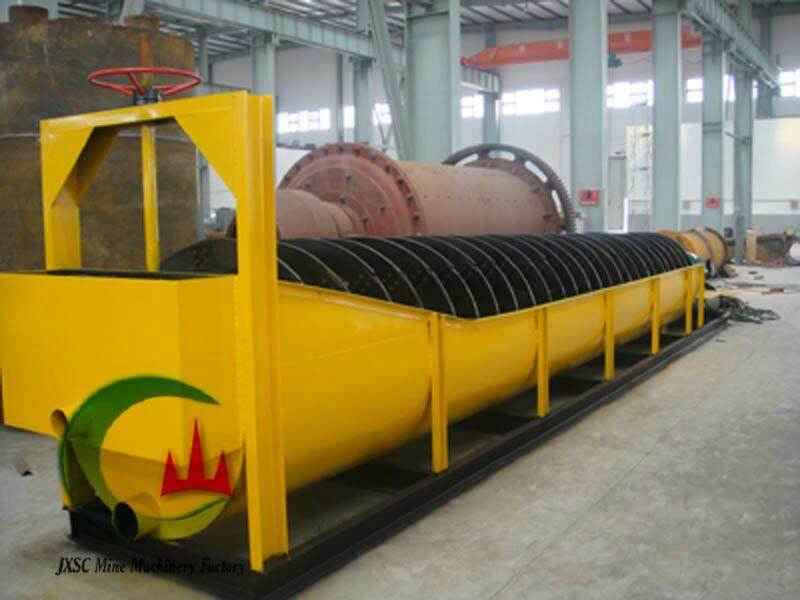 Spiral classifier also called screw classifier, rotary classifier, it is a main mining equipment which widely used for mineral washing process / ore beneficiation process, as well for dewatering, drainaging for medium and fine material wet classifying in mine. According to the difference in sedimentation rate of mineral particles and mud, the particle sizes of ores with 14-325 mesh is classified. Waste mud and water for ore sand can be separated from the raw ores. Spiral separators are designed to provide the most effective pool area and overflow velocity requirements. The proper combination of pool depth, area and spiral construction is important to secure a controlled turbulence in the slurry flow for accurate size separation. The most important thing is that our spiral separator price is rather reasonable compared with other similar products. Spiral classifier equipment is divided into single spiral classifiers and double spiral classifiers. Beside, they are also divided into high weir spiral classifiers and submerged spiral classifiers. JXSC ore spiral washer concentrates with good effect. More and more customers choose it as the first option for silica sand / black sand washing. It’s more suitable for finer ores which less than 5mm. Silica sand spiral classifier is composed of a U trough, spiral, transmission, elevator machine, support bearing, etc. The down flow weir of the high weir type is higher than the lower bearing, but lower than the upper edge of the lower spiral. There is a horizontal long axis with helical blades in the U trough, and a down flow weir designed in the lower place. The transmission is installed in the upper chute; the upper main spiral shaft supports the bearing on the drive frame, while the lower bearing is fixed at the level of the elevator. The elevator is able to make the lower part of the spiral ascend and descend to regulate the distance between the spiral and the bottom of the chute as well as the confirming size of the spiral. Meanwhile, the spiral should be raised up at the time of a stop in order to avoid the desilting burying the spiral that will impinge on starting. The bearings of the main spiral shaft are quite vital parts, due to relatively harsh working conditions; the requirements for the sealing of the bearings are high. At the same time, the operator must strengthen the maintenance.